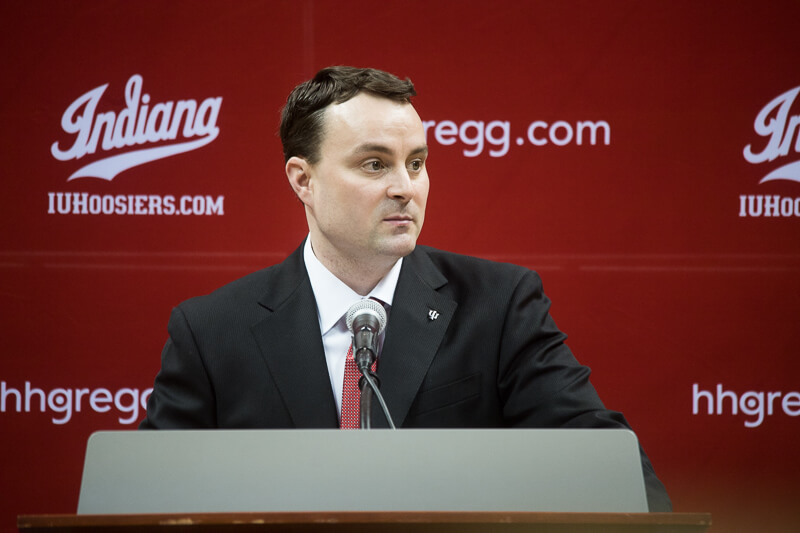 When Archie Miller took the podium on Branch McCracken Court at Simon Skjodt Assembly Hall and was officially introduced as Indiana’s head coach back on March 27, recruiting was heavily emphasized in his comments. But it wasn’t a sales pitch nor was it hyperbole or a guarantee of what the future would hold. Instead, Miller was confident and straight forward with the approach that he planned to implement in Bloomington. While acknowledging the importance of connecting with in-state recruits, Miller emphasized recruiting the Big Ten footprint diligently. In a span of 20 hours that began Sunday evening, Indiana fans got their first glimpse of Miller’s no nonsense plan delivering results. Three top 100 prospects – Race Thompson, Jerome Hunter and Damezi Anderson – pledged their commitments to the program. Start with Thompson, who will join the roster next season, but will use his first season in Bloomington to redshirt. The 6-foot-7 forward said on Sunday that once he started to build a relationship with Miller and associate head coach Tom Ostrom, the decision to commit was an easy one. Not only was pulling Thompson out of Minnesota a significant recruiting coup, but Indiana will have him on campus for a year learning the system before he ever suits up. The recruiting news, however, didn’t stop with Thompson. Early Monday afternoon, Pickerington North (Ohio) forward Jerome Hunter tweeted his commitment to the Hoosiers. A top 60 player nationally according to the 247Composite, Miller and Hunter had a preexisting relationship from his time at Dayton. And the IU coach was one of the first coaches to express interest in Hunter, which is something he never forgot. Less than two hours later, Miller and the IU coaching staff struck again with the commitment of South Bend Riley forward Damezi Anderson. He’ll be the first scholarship player for the Hoosiers from South Bend since Tom Abernethy arrived in 1972. The four-star prospect was long considered a top target of Purdue, IU’s in-state rival, but the Hoosiers quickly became a favorite for Anderson after he visited in June and received a scholarship offer. The significance of a kid from northern Indiana calling IU home can’t be overstated, especially when you consider the program’s lack of in-state recruiting success in recent seasons. Indiana produced four top 50 recruits in the 2017 class and none of them are enrolled at IU. Anderson is the first top 100 player from Indiana to pick the Hoosiers since James Blackmon Jr. But even with a steady recruiting nucleus established, Indiana isn’t done recruiting for 2018. Three scholarships are still available and with momentum on its side, Indiana will look to finish out the class strong. Indiana has jumped head first into the Romeo Langford recruitment and is expected to receive a visit sometime this fall from the five-star shooting guard. If Langford had any questions about the talent that Indiana would be able to surround him with in Bloomington, the coaching staff is beginning to provide answers. Top 100 McCutcheon point guard Robert Phinisee acknowledged on Tuesday that he took notice of the flurry of commitments and had already spoken to Anderson. The offer to fast-rising Ben Davis forward Aaron Henry is also still on the table. Beyond that, the Hoosiers are also still involved with several top 100 prospects from around the country. Less than four months into his tenure, it’s becoming clear that Miller’s approach laid out in late March is more than capable of producing recruiting success. I can’t disagree. He looks awfully good. Don’t count us out this year. Archie’s coaching is as good as any. MSU would be tough to overcome, but I would not be shocked if we end up 2nd in B1G. Phinisee is a four year player. I would rather have a four year starter at pg. A one and done pg doesn’t get to know the system as well nor do they get to build an on court relationship with the other players. We haven’t even offered Moses Brown, who has already been targeted by an entire army of top schools. I would say that that road is basically impossible to start. Don’t forget about having De’Ron Davis on the team. He showed true ability as an actual center last year, and that was as an “out-of-shape” (as they have referred to it) freshman with injuries. I think he will have a break-out year, come back next year, and possibly forego his senior year for the draft. The whole family seems to be recruiting machines. I’m just glad Sean is way out west in AZ and won’t be competing with Archie for many players. That would be a crazy battle. Good point Leaders, I just really feel that we need to value a true center little more than we have been. Oh, you won’t find someone who agrees with you more. I completely believe in having a true center. That’s why I have hope in Davis, because he’s that solid big with true post moves and a presence down low. Well, he showed that sometimes, at least. I agree, hopefully we start seeing some focus on the bigs, and I think we’ve got the perfect coach to do that. Seems like his speciality is making solid strong forwards, so I trust his process.